Many devoted Christians hope the end of these “last days” is near. Seeking signs to prove Jesus’ physical return is imminent, their attention has been fixed upon the Republic of Israel since its founding on May 14, 1948, when this new Israeli state brought to an end nearly 2,000 years of Jewish statelessness. A new look at Old Testament prophecy has resulted. Renewed emphasis on the Old Testament and some of its prophetic books has resulted in large scale neglect of New Covenant theology. Old Testament study about the vanished covenanted Israel has replaced New Testament teachings about God’s true Israel. Incorrectly equating the new Israeli republic with the Old Testament Israel is the result. Emphasizing Old Testament teachings of the Jew’s spiritual exclusiveness and superiority in God’s eyes misses how the New Covenant, reported in the New Testament, changed that doctrine. The natural byproduct of BC doctrines is that today’s Israeli state is felt to be the same as BC Israel. Articulate teachers press this belief from every direction by every media. Clear reasoning should tell us that current Jewish/Israel/Zionist teachings relegate Christians to second class citizenship in God’s plan of action! Logic shows that such Zionist theories yield two covenants, with the old one of the Jews having priority to the New Covenant of Jesus. That implies the New Testament is a fraud – which is what Jews assert. Two covenants can’t be if we are to read and believe the New Testament. The Christian message is about only one covenant, the one Jesus brought with His blood on the cross. If Jesus’ Covenant is the one and only, then any teaching contrary to that is heretical. Christians do not accept two covenants, one of faith and the other of race. Jews do not accept Jesus’ Covenant of freely given faith and grace. Jews, in our times, insist non-Jews, are outside of God’s favor and are “Goyim “- heretics – who can never be “chosen” people of God for lacking a Jewish mother. This is a real problem in our times – too many people teaching too many end-time theories, all starting from the existence of the Israeli state. Using the prophetic books of the Old Testament, while ignoring the New Testament message, yields incorrect conclusions. From this overabundance of speculative prophecy, soothsaying and much pure fiction, comes many contradictions. Resulting confusion, debate, and division within the body of Christ dampens our love for one another. Because of these differences, we experience an erosion of our peace and joy in the Holy Spirit. In short, we are arguing about unproven nonessentials when we should be sharing love and agreeing on New Covenant essentials. Our calling is to be peacemakers, not debaters. Being an imitator of Christ is different than being a commentator on the implications of international political and economic events. Christians are required to be experts on the words of Jesus rather than those of some soon-to-pass prognosticator who promotes peculiar prophecies. Too often we are found studying the latest paperback book’s opinions on the meaning of the most recent event in the Middle East, instead of using our time to study the words of Jesus, the “red letters” of the New Testament. Granting the importance of Jesus’ return, how do we study about it? How do we find the truth about our continuing hope for his final coming? We must commit ourselves to finding the truth, in spite of our fondest hopes and most pleasing opinions. Truth, regardless of its comfort, or lack of it, must be our primary goal. God requires truthfulness from us. This requirement directs us in a single-minded search for it, regardless of the consequences. We cannot be guilty of passing on hear-say opinions obtained from unknown people. To satisfy ourselves, we need to do our own search for the end-time truth. We need to know we have found the truth, and not simply blindly followed another’s untested opinions. We must test each idea by asking, “What did Jesus say?” When we look to His words we usually find the answer we need with little difficulty. Measuring all ideas against Jesus’ words gives us a foundation of understanding to which we can add more information from history. So, the source of historical records, for a Christian, is first the Bible and then secular records. In studying the Bible, Christians place primary importance on the New Testament, so we study it in an orderly way: Jesus’ words first, then the balance of the New Testament in the order in which it is preserved, and finally the Old Testament in its preserved order. This prevents our taking scripture out of context with resulting invented doctrines, too often contrary to God’s order of thought and transmission. Last, we look to reliable secular historical records about our religion. These records are important because they give information on events which occurred after the Bible was completed. Studying all such available records, after the Bible, usually reveals full historical truth. To find the truth about God’s true Israel and its relation to the end-time, we must apply this test and search all these sources. History’s record testifies that before the formation of the twentieth century Israeli state, all Christian theology taught that God’s new Israel was the spiritual Kingdom of God, neither worldly nor political. History also proves that all end time prophecies during the past 2,000 years have been wrong – except Jesus’ predictions of the fall of Jerusalem and the Temple, his resurrection, his spiritual return to Earth, and the coming of the Holy Spirit to make Christians “temples” to replace the destroyed Temple in Jerusalem. Before the cross, Israel was both a political and a spiritual kingdom in a geographical location. After the cross it became God’s spiritual kingdom, not a worldly place or power (John 18:36), with all believers in Christ as citizens. Simply, it was not a place but a spiritual condition. It was the condition of being born again through belief in Jesus. Martin Luther explained this traditional view in his classic commentary on Paul’s letter to the Galatians. Discussing Galatians 6:16, Luther wrote the following passage. Next, it is clear that entry into God’s kingdom does not come through a blood relationship to Abraham, but through faith in Jesus. Checking Jesus’ words again, we see He said the Jews were satanic and not children of Abraham. This shows that the Old Covenant, with Jews the covenanted people, was replaced by the New Covenant of faith through Jesus Christ. The new holy nation (Kingdom of God; Kingdom of Heaven) is made up of all who are one in Christ. Spiritual Israel has replaced the earlier worldly Israel since the cross and Jesus’ resurrection. When Jesus died on the cross, the old Covenant died with him (Matthew 27:50,51). When he arose, the new covenant arose with him. Clearly, there is only one covenant, the New Covenant of Jesus Christ. Since the Old Covenant is gone, vanished away, there are no covenantalpromises or prophesies remaining in it for the Jews and a Jewish Israel. These now belong to the new Israel of God by faith. The impossibility of two covenants, one Christian and one for Jews, is obvious. Jesus said He is the way, and no one can come to the Father except through Him (John 14:6). This excluded a Jewish covenant given through race with promises and prophecies that substitutes for Jesus’ covenant. To do an overkill on this point, we may review the fourth chapter of Romans and the second chapter of Peter’s first letter. The conclusion is that Christians, the Body of Christ, are now God’s holy nation, the true Israel under the Gospel, since Jesus’ salvation. Christians are the inheritors of Abraham’s promises through faith in Christ The old Israel and the Old Covenant to the Jews ceased and vanished. That covenant ended when Jesus died on the cross. Promises and prophesies to BC Israel now belong totally to those under the New Covenant. Those closed for Israel of the Jews on the first Easter Sunday. Christian faith is in the shed blood of Jesus purchasing our New Covenant with God at his cross. By grace, both Jew and non-Jew can come into the new Israel of God through faith, not by race or by works. Also countering this heresy is the historical disproof of claims about the Israeli republic. Contemporary Israel is NOT the first Jewish state since the Old Testament prophecies were written, it is the third. All end-time prophecies arising out of the Israeli state in relation to events in the Middle East rest on a common mistake. That mistake is the belief that the 1948 restoration of Israel is the first and only restoration since the Old Testament times. This is taught by all speculative end-time prophets, who believed restoration has not occurred before and that it signifies something very unique. History contradicts this belief. The fact is that there were two independent Israeli monarchies, with temples, in the inter-testament period between the Old and New Testament writings. Contemporary Israel is outside the Torah because is not a monarchy and does not have the necessary Temple. The first kingdom was reestablished after the Maccabean revolt occurring about 152 BC. Israel won its independence from the Seleucids, a “tribe” (nation) from the north (Syria) in that year after a long and bloody struggle. Jewish patriots recaptured and cleansed the temple, an event commemorated by the ‘Festival of Lights’. The restored monarchy, known as the Hasmonaean Dynasty, gave a period of peace and prosperity from 152-65 BC It had a fully restored priesthood, and temple worship, according to the law. The monarchy ended in civil war, with two Hasmonaean heirs struggling for the throne. Roman interest in the area began about 65 BC Herod the Great neutralized Roman influence through diplomacy and entered the conflict as a third contender for the throne. He won the civil war in 37 BC and became king. This was the second kingdom. Herod’s reign began with independence from Rome, even though Israel later became a puppet state by his death in 4 AD. That later servitude of Israel obscures the fact that Herod was first independent. Thus, in the beginning under Herod’s rule, Israel was allied with, but not subject to, Roman rule.Therefore, Herod’s independent monarchy was the second time Israel was an independent nation between the close of the Old Testament and 1948. Any restoration of covenanted Israel would subvert Jesus’ exclusive New Covenant. Israel can never be in a Torah relationship with God, and under His anointment, without blood atonement. It cannot have atonement without blood sacrifices. It cannot have blood sacrifices without its temple and priests, using the prescribed religious artifacts which remain lost and unrecoverable. A restoration of ancient Israel’s Torah religion would necessarily be a competitor religion to Christianity in the same way Islam, Hinduism, and other Pagan religions based on works contradict Jesus’ New Covenant that is based on faith. and freely given grace. It would deny and replace Jesus and his Gospel. The new Israel, God’s true Israel, a holy nation, is in fact the fellowship of true followers of Jesus, where ever they are. This body of Christ, the whole collection of Christians, received atonement through the one final sacrifice of Jesus’ shed blood on the cross. Jesus remains the high priest, the only mediator between man and God. Through Jesus’ final work, anyone can become a temple by receiving the Holy Spirit. Our body, not a building, becomes the temple of the Holy Spirit through the baptism given by Jesus’ sacrificial blood and free grace. This is the New Covenant which replaces that vanished Old Covenant. It is the Kingdom of God, the Kingdom of Heaven. Consequently, all claims that the Republic of Israel is a restoration of Old Testament Israel fail. Israel is not Torah Israel since it is neither a monarchy nor does it have a functioning temple. It is not spiritual Israel because the body of Christ is God’s true spiritual Israel. Finally, it is the third restoration, and not the first as is mistakenly asserted. Knowing we cannot rest our end-time hopes on the Israeli state and the political events of the Middle East, we must find a surer barometer. In our hope for the “soon” coming of our Lord Jesus Christ, we want to know the signs to be inspected. The directions which we can follow are simple and easy to find in the New Testament. We need only search the teachings of Jesus and the Apostles on this subject. We do not search the Old Covenant prophets. Paul helped to clarify end-time signs by writing to the Thessalonians. There he said Jesus would not come again until the “son of perdition . . . takes his seat in the temple of God, proclaiming himself to be God”. (2 Thessalonians 2:1-12, esp. 3 & 4, RSV.) Since there is no temple in Jerusalem, this event is not in sight. We can always go back to the basic Source for understanding. What did Jesus say? What did He command us to do for Him before the end can come? We have our work cut out for us if we want to see Jesus come in the flesh anytime soon. At least half of the world’s population has not even heard Jesus’ name, much less been converted and discipled. We will never fulfill this commandment while debating and speculating on Middle East events. What shall we do? What is our next move? What would Jesus have us do? More speculation and debate or more Jesus? We might start by thinking how we might convince 1.2 billion Muslims, 1 billion Hindus, 1+ billion Pagans following other spiritual concepts, the innumerable agnostics, Jews, and lost “System Christians” to God’s True Israel. What ideas can you offer? It appears that in the 2,000 years since Jesus sacrifice, of the 6.4 inhabitants of Earth only 400, 000,000 are in God’s True Israel. The score is 6 billion out of the Kingdom, 400 million in it. What can be done to change that? Then pray to be entered into the Kingdom of Heaven. John 6:70 Jesus answered them, Have not I chosen you twelve, and one of you is a devil? Acts 13:27 For they that dwell at Jerusalem, and their rulers, because they knew him not, nor yet the voices of the prophets which are read every sabbath day, they have fulfilled them in condemning him. The Jewish power grab.. every one of the Jews, Judas the Betrayer especially had falsely expected of the coming restoration of Kingdom f Israel by Jesus Christ but it never happened and never will ……. Acts 1:6 When they therefore were come together, they asked of him, saying, Lord, wilt thou at this time restore again the kingdom to Israel? 7 And he said unto them, It is not for you to know the times or the seasons, which the Father hath put in his own power . Jesus made obsolete the Old testament, Old Covenant, old Israel and introduced the New Covenant, the new Church, the New Israel. Speaking of Christians the now chosen only.. John 15:16 Ye have not chosen me, but I have chosen you, and ordained you, that ye should go and bring forth fruit, and that your fruit should remain: that whatsoever ye shall ask of the Father in my name, he may give it you. Acts 3:12 When Peter saw this, he said to them: “Men of Israel, why does this surprise you? Why do you stare at us as if by our own power or godliness we had made this man walk? Acts 5:11-13 Great fear seized the whole church and all who heard about these events. 2 The Temple of God (1 Cor. 3:l6; Eph. 2:2l,22; 1 Pet. 2:5). 3 The Jerusalem From Above or The Heavenly Jerusalem (Gal. 4:26; Heb. l2:22). Both of these terms (as well as “temple”) illustrate how the Old Testament notions of outward sanctuary have been replaced with the literal dwelling of God in his people. 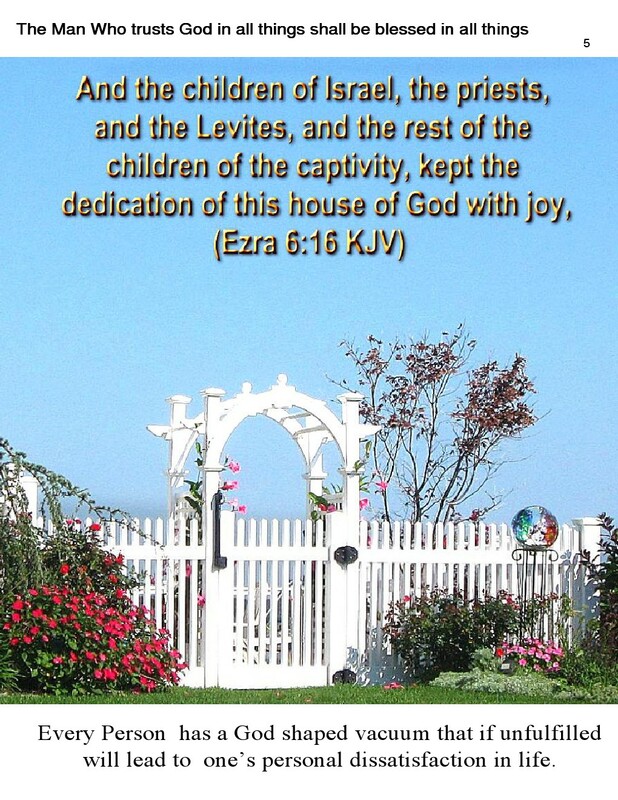 4 Bride of Christ or Christ’s Betrothed (Eph. 5:25-32; 2 Cor. 11:2). These titles refer to the love and loyalty existing between Christ and believers. What constitutes the local church? where “. . . two or three have gathered together in my name (Jesus Christ) . . . ” (Mt. l8:20) This is Christ’s version of what is necessary to have a local church. A too common approach those falsely interested in dismissing the gospel message of Jesus Christ is falsely trying to discredit personally the gospel messenger and his content and mainly reflects their more eagerness to find supposed faults than to find the truth..
Too many Jews falsely that Jesus was a good teacher who never claimed to be the Messiah or the Son of God. They also do lie and claim that Paul imported pagan ideas into the Jewish teaching of Jesus in order to appeal to the Gentiles and to create a new religion. Paul, they lie and say, was the false”inventor” of Christianity and a false detractor of Judaism since he had taught that the Torah was of no value. Many Jews since then too falsely too have hated Apostle Paul from the start and no surprise here they tried to kill him many times.. Now one cannot claim Jesus’ teachings were distorted without first knowing what Jesus taught and few of Apostle Paul’s false detractors do even. All those who claim distortion demonstrate a lack of knowledge of Jesus ’real teachings. One need only read the first four books of the New Testament (not written by Paul) to see the invalidity of their false claims.. None of their false claims about Apostle hold up under real inquiry, and they are all unsupported by the New Testament, Real Christianity. These false Detractors most commonly ascribe Apostolic doctrines such as the deity of Jesus, the resurrection, sacramental meals and baptism to pagan origins. But if you’ll investigate the New testament , you’ll see each of these doctrines or events as being even recorded in the first four books of the New Testament, all not written by Apostle Paul. Two of the four writers there were some of Jesus’ closest associates. John the Baptist, Jesus’ forerunner, practiced baptism long before Paul was on the scene. God’s has preserved the Old Testament scriptures that they might never be lost. He did do this also for the Jews’ sake , as the Jewish scriptures are able to make the Jewish people“wise unto salvation through faith which is in Christ Jesus”(1Tm 3:15-17). Hebrews 11:8-10 By faith Abraham, when he was called to go out into a place which he should after receive for an inheritance, obeyed; and he went out, not knowing whither he went. By faith he sojourned in the land of promise, as in a strange country, dwelling in tabernacles with Isaac and Jacob, the heirs with him of the same promise: For he looked for a city which hath foundations, whose builder and maker is God. Only a fool and lie and say that God’s promises to Israel were unconditiional and make false doctrines based on isloated Bible verse now too.. l.. The House of Abraham, Jacob, house of Judah, house of Israel are related but also by God, in the Bible are treated as separate entities and the House of Israel’s prophetic prospects were significantly different, opposites from those of Judah. “The prophets of Judah could look forward to a restored people to God . But still the ten tribes of Israel had no separate future. Their earthly kingdom promises, banishment, punishment was irreversible.” That was another of God’s promises Israel could claim too.. But now in Christ Jesus you who formerly were far off have been brought near by the blood of Christ. For He Himself is our peace, who made both groups into one, and broke down the middle wall of division between us, having abolished in His flesh the enmity—the Law of commandments contained in ordinances—so as to create in Himself one new man from the two, thus establishing peace; so that he might reconcile both to God in one Body through the cross, by it having put to death the enmity. And He came and preached peace to you who were far off, and peace to those who were near, for through Him we both have our access in one Spirit to the Father (Ephesians 2:13-18).